During fall break, I traveled with thirteen other Notre Dame undergraduate students to the Galápagos Islands as part of a new science course, Practicum in Field Environmental Biology. Under the direction of Biological Science Professors, Gary Lamberti and Malcolm Fraser, we explored the islands and each student investigated an individual research project that personally interested them and focused on observation of unique species in the islands. I studied the evolution of Opuntia, prickly pear cacti, to better understand how the cacti on each island adapted to predators, such as land iguanas and giant tortoises. I measured the trunk diameter and height of the lowest branch on Santa Fe and South Plaza to compare their development when exposed to a different number of predators. Even though these islands that we visited had few or no giant tortoises to eat the cacti, I concluded that there was a significantly higher branch height on Santa Fe, where there were substantially more land iguanas. While I also learned of other factors involved in the evolution of the cacti during my research, this data could support the idea that the cacti evolved to grow taller to escape predators. 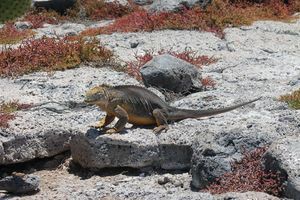 Haley Barlow, a senior majoring in Biological Sciences, compared morphological ratios between land and marine iguanas and studied the differences in their characteristics that could support where they live. She measured approximate body and tail length of both types of iguanas and photographed them to consider ratios. After analyzing the trends, she concluded that the tail may account for a greater proportion of body length in marine iguanas, since they require their tail to propel them through water. Forelimb thickness did not seem to differ between them,; however head shapes may aid in each species’ feeding habits. Alec Biscopink, a junior majoring in Neuroscience and Music Performance, observed the pioneer species of plants that grew around aging lava flows to understand the timeline of primary succession. 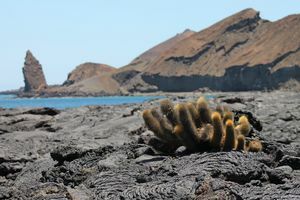 He studied the arid zone species and found salt tolerant species, such as lichens and mangroves, in the littoral zone and learned that new bare lava included pioneers Mollugo and lava cacti, while older lava had developed the colonizers Opuntia. Alec compared the early and late stages of succession in order to determine the differences in colonization that can occur over time. 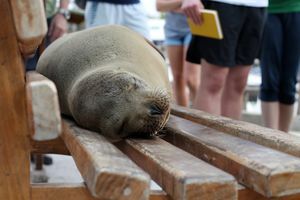 Maria Sasso, a junior majoring in Neuroscience, studied the interaction between humans living on the Galapagos Islands and the sea lions there, in order to analyze the effects of exposure on sea lion behavior and habitat. She concluded that sea lions, like most of the other creatures on the islands, are minimally threatened by human contact. She also noted that some sealions have even been influenced by human interaction and now exhibit behaviors that mimic domesticated dogs, particularly at the fish market where fishermen would feed a few sea lions who visited regularly. These are just a handful of the topics that Notre Dame students researched, while exploring the Galapagos Islands. Undertaking research in a place that has inspired theories that are crucial to scientific history was incredibly surreal. We discovered the Galapagos Islands for ourselves, studying its most unique features and applying our own ideas in a close-up learning environment. It was a thrilling experience to observe these organisms in their natural habitat, and this trip became a source of inspiration for our future research and connection to the environment. To learn more about this trip, read my first blog on the Galapagos Islands. Anna Chang is a junior at the University of Notre Dame, studying Science-Business and Greek & Roman Civilization. She is currently a Intern with the Notre Dame Environmental Change Initiative. Images within the story were provided by Haley Barlow. Image on science.nd.edu/news provided by Sophia Chau. Funding for the engagement portion of this course was provided by the Notre Dame Global Adaptation Initiative in collaboration with the Center for Social Concerns through a Course Development Grant. 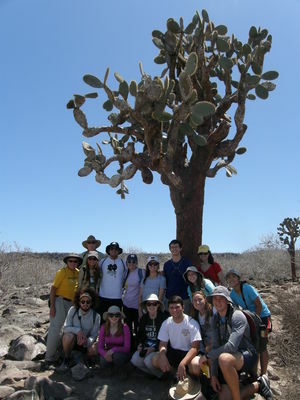 Notre Dame International implements this program in partnership with the Biology Department. Originally published by Anna Chang at environmentalchange.nd.edu on December 02, 2016.